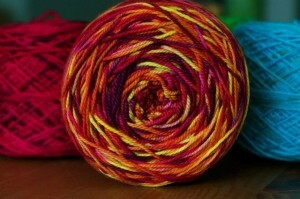 One of the questions that gets fired off at the shop a lot is “Why does yarn come in these annoying skeins? It should come in a ball so I can just knit it right away”. I hear what you’re saying but I’m here to share the reason for this formatting. This is the style people find so frustrating, but let me tell you a couple of reasons yarn comes in hanks. First off it is dyed this way. Especially if you are looking at smaller dyers or hand dyes in general the yarn is dyed in the hank so they sell it that way. The second reason is that it packs down nice and small for shipping, not like those pesky balls or cakes. 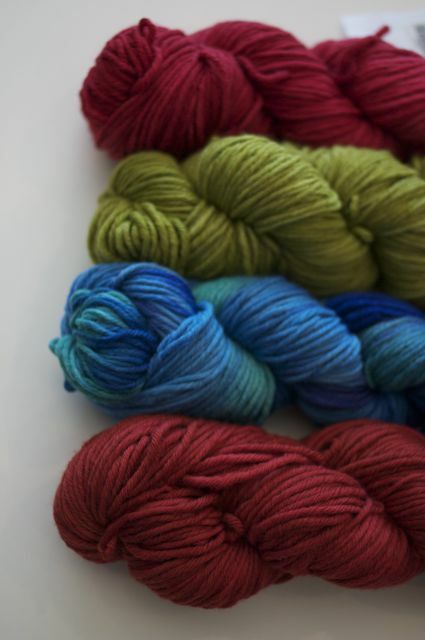 The third reason yarn is not usually sold in cakes is that it stays smoother in the hank. There are no crinkly bits if you leave your yarn in a nice loose hank. If your yarn is wound into a cake or ball too tightly and it sits in the cake or ball for some time, it can also become stretched. 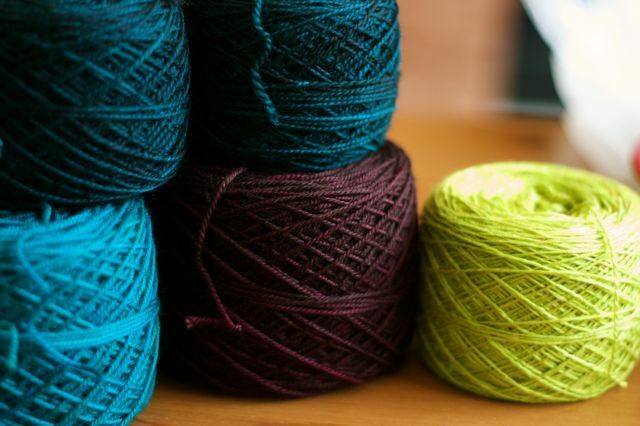 It’s recommended that you leave your yarn in the hank until you are ready to work with it (this is not so convenient if you don’t have your own ball winder but it is ideal). 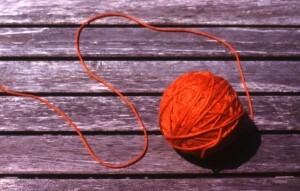 And so folks, that is why yarn often comes in hanks rather than skeins and balls. Cakes of yarn are usually what you would turn a hank into. It can be pulled from the center or the outside (I always recommend the outside, not as satisfying but way fewer tangles if you do it this way). I like the cake the best because it just looks so darned pretty. 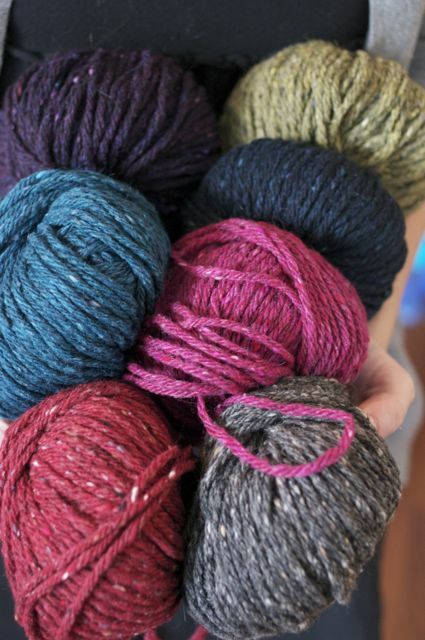 It looks fresh and ready to be knit. A pretty cake just makes me want to cast on a new project right away! 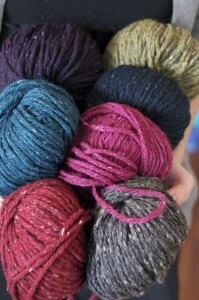 There you have it, balls, skeins, cakes, and hanks! Brooklyn Tweed KAL update: Finished the second lace chart on my Rock Island! Garter stitch here I come…. I’m feeling so confident I might just finish that BT Tweed Baby Blanket I cast on so long ago! This entry was posted on Monday, May 30th, 2011 at 11:56 pm	and is filed under Uncategorized. You can follow any responses to this entry through the RSS 2.0 feed. Both comments and pings are currently closed.